Son of John Gonzalez de Castrillo and Sancia Martinez, the oldest of seven children, their first after sixteen years of sterility and frustration; raised in a pious and well-to-do family. Educated by Benedictines at Fagondez abbey at Sahagun. Ordained in 1445. Held several benefices in the diocese of Burgos, Spain, his father obtaining them for him like investments, but John surrendered all but one. Unlike many of his class who took their vocation as a profession, John felt a true call to service and a holy life, and he gave most of the proceeds from his benefices to the poor. Majordomo in the residence of his bishop. Studied at the University of Salamanca, and then at Burgos. Following a grave illness and major surgery, he became an Augustinian canon at Salamanca, joining on 18 June 1463, and making his final profession on 28 August 1464. Novice-master in the order. Definitor of his province. Prior of the order in Salamanca in 1471. Noted for his devotion to the Blessed Sacrament; during Mass, he often saw the Host surrounded by light, sometimes had visions of the bodily form of Christ at the moment of consecration. His devotion, and his visions, often led to some very lengthy Masses. Reported to levitate during his prayers. Could read hearts in confession, and became a sought-after spiritual director. Great preacher whose sermons helped change social conditions in Salamanca. His sermons against sinful living conditions, and in support of the rights and diginity of workers brought him the opposition of some local leaders. A duke at Alba de Tormes hired assassins to stop him, but they recognized John's holiness, and would not touch him, confessed to him, and asked forgiveness. The duke later fell ill, and was healed by John's prayers. Some local women, however, were not so concerned; when he preached against wasting resources on extravagant fashions, some of them threw stones at him in the street. Miracles were attributed to Father John's intervention, before and after his death. One occurred in Salamanca when a small child fell into a well. The locals made every effort, but could not effect a rescue. They sent for Father John who went to the scene, laid his waistband on stone wall of the well, and prayed that the waters return the child. The well water rose to ground level, floating the child to safety. This incident is depicted in the image of Saint John on this page. Son of Melkon and Faridé Maloyan. Studied at the convent of Bzommar-Lebanon where he was ordained on 6 August 1896. Member of the Bzommar Institute. Took the name of Ignatius in remembrance of Saint Ignatius of Antioch. Parish priest in Alexandria and Cairo, Egypt from 1897 to 1910. Assistant to Patriarch Boghos Bedros XII in 1904, but respiratory health problems forced his return to Egypt. Dispatched to the diocese of Mardin to restore order and discipline. Archbishop of Mardin on 22 October 1911, working with the Armenian Catholic minority. Encouraged the devotion to the Sacred Heart. At the outbreak of World War I, Armenians in Turkey, especially Christians, became the target of persecutions. On 30 April 1915 a group of Turkish soldiers surrounded the Armenian Catholic Bishopric and church in Mardin, claiming it was used to hide weapons. On 3 June 1915, Turkish soldiers arrested Bishop Maloyan along with many other Armenian Catholic priests and laymen. In court, chief of the police Mamdooh Bek ordered bishop Maloyan to convert to Islam; the bishop declined, and was beaten, tortured, chained, and imprisoned. On 10 June 1915, Ignazio and over 400 other Christians, including fourteen priests, were force marched into the desert. When they stopped, bishop Ignazio celebrated an impromptu liturgy with scraps of bread; the group was then murdered. The bishop was the last to die. At the last minute, Mamdooh Bek again demanded that Ignazio convert to Islam; when the bishop refused, Bek shot him. Levite Jewish convert, coming to the faith soon after Pentecost, taking the name Barnabas. Though not of the chosen Twelve Apostles, Barnabas is mentioned frequently in the Acts of the Apostles, is included among the prophets and doctors at Antioch, and is considered an Apostle. Companion of Saint Paul who introduced him to the Apostles. Like Paul, Barnabas believed in the Church's mission to Gentiles, and worked with him in Cyprus and Asia, but split with him over a non-theological matter. Evangelized in Cyprus with Saint Mark. Founded the Church in Antioch. Subject and possible author of some apocryphal works. Martyr. Only daughter of John and Angela Frassinetti, she was raised in a pious family; all four of her brothers became priests. Paula's mother died when the girl was nine years old. In need of a substitute mother, Paula turned to Our Lady. One of Paula's aunts moved in to help with the family, but she died three years later, and at age twelve, Paula took over as homemaker. Because of the endless chores at home, Paula was not able to attend school. However, each night her brothers would pass along what they had learned that day, her father filled in the gaps, and Paula actually had a good education. She attended Mass daily, and prayed her way though all of her work. At age 20 she developed respiratory problems, and moved in with one of brothers, a village priest in Quinto, Italy. When she recovered, Paula, with her brother's help, opened a parochial school for poor girls in the area. In 1834, with a group of like-minded young women, she founded the Sisters of Saint Dorothy (Frassinetti Sisters), a congregation dedicated to educating poor children. They soon opened foundations in Italy, Portugal, and Brazil, and were noted for their work with the sick in the cholera epidemic that ravaged northern Italy in 1835. The Sisters received papal approval in 1863. At age seven Aleydis was sent to the Cistercian convent of Camera Sanctae Mariae to receive an education; she stayed the rest of her life. In adolescence she developed leprosy and was isolated from the community; the spirit with which she bore her illness served as an example to the rest of the community. While in isolation, Aleydis developed a deep devotion to Real Presence in the Eucharist, but was unable to drink from the cup due to the danger of contagion. As the disease progressed, she became blind and paralyzed. Visionary; given to ecstasies, and a visit from Christ to assure her of the complete Communion of the Eucharist. Was given the gift of healing of others, but not herself. Born a princess, the daughter of King Bela IV of Hungary and Maria Laskaris. 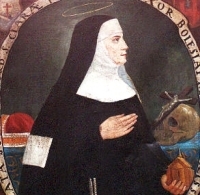 Niece of Saint Elizabeth of Hungary, grand-niece of Saint Hedwig of Andechs, and younger sister of Blessed Cunegund of Poland, who raised her. Married to Duke Boleslas V, the devout prince of Kalishi, Pomerania; mother of three. Franciscan tertiary. Founded a Poor Clare convent in Gnesen, Poland. Widowed in 1279. She, one of her daughters, and Cunegund retired to a Poor Clare convent Cunegund had founded in Sandeck. Just before her death, Helen became superior of the convent she had founded in Gnesen. Camaldolese monk at age 12 at the monastery of Saint Michael's. Hermit. Priest. Chaplain and spiritual director of the Saint Christina convent of Treviso, Italy in 1191; he served there for 72 years. Cared for the spritual needs of pilgrims and the sick at the All Saints Hospice at his monastery. Miracle worker. Had the gift of prophecy. Benedictine monk at Fulda, Germany. Abbot of Werden Abbey, Essen-Werden, Germany in 1029. Abbot of Hersfeld Abbey, Hesse, Germany in 1031. Archbishop of Mainz, Germany in 1031. As monk, abbot and bishop he was known for his simple, ascetic life, his charity to the poor, the gift of prophecy, and his care for animals. Known as a pious and intelligent youth. Premonstratensian monk. Canon of the Premonstratensian monastery in Vicogne, France. Chosen abbot of his house in 1513, he refurbished the monastery, spent his nights in prayer, and was known for his charity and aid to the area poor; he served as abbot for 37 years. Advisor and confessor to Emperor Charles V. Declined the bishopric of Arras, France as it owuld have meant leaving monastic life. Premonstratensian monk. Canon of the Grimbergen Premonstratensian monastery in modern Flanders, Belgium. Priest. When Calvinists controlled the region in 1581, Kasper dressed as a layman and travelled from town to town, ministering to covert Catholics in their homes. Benedictine monk at Turhout, Belgium. Worked with Saint Ansgar as a missionary to pagan Scandinavia. Bishop of Hamburg-Bremen, Germany in 865 with jurisdiction over Denmark and Sweden. Worked to evangelize the Slavs in his region, and ransomed Christian captives. Wrote a biography of Saint Ansgar. 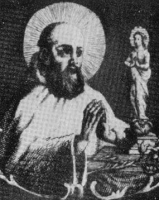 Evangelized in France with Saint Fursey of Peronne, finally settling in Seganne, Champagne where he was known for his life of penance and prayer. 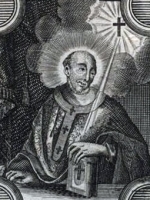 Bishop of Naples, Italy in 359, but spent much of his service in exile for having defended the Nicene Creed against Arian rulers. Martyr. Ninth-century monk and then abbot of Bangor Abbey, County Down, Ireland. He led the house during a bleak period of recovery following a series of Viking raids. Educated at Rheims, France. Benedictine monk at Saint Martin's abbey, Tournai, Belgium. Abbot of the monastery at Marchiennes, France in 1148. A holy virgin venerated in Kilmore, Ireland. Eighth century hermit in Brittany. A church in the diocese of Killfenora, Ireland was dedicated to him, but no details of his life have survived. Three Mercedarian lay knights who worked to ransom Christians enslaved by Muslims. During the 7th Crusade, a plague swept through the Christian army and these knights volunteered to work with the sick. During this work they were captured by Muslims and ordered to convert to Islam; they refused. They were tortured, taken to Damietta, Egypt where they were murdered for their faith. Martyrs.